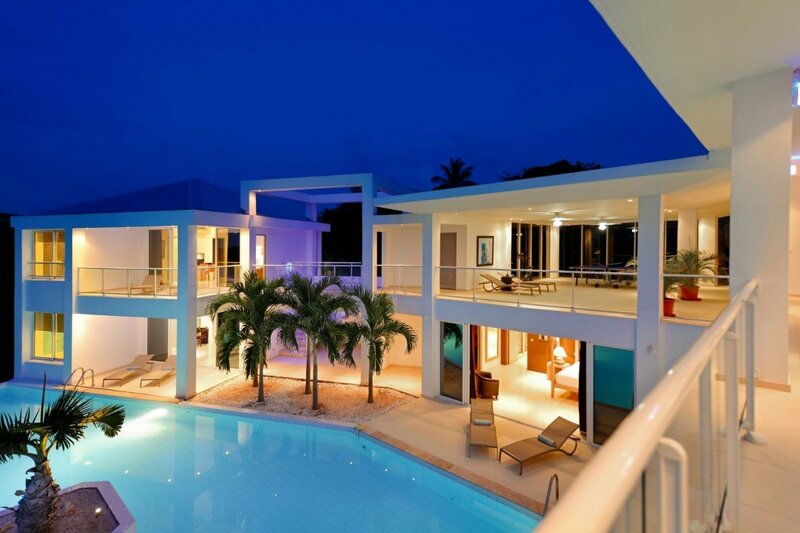 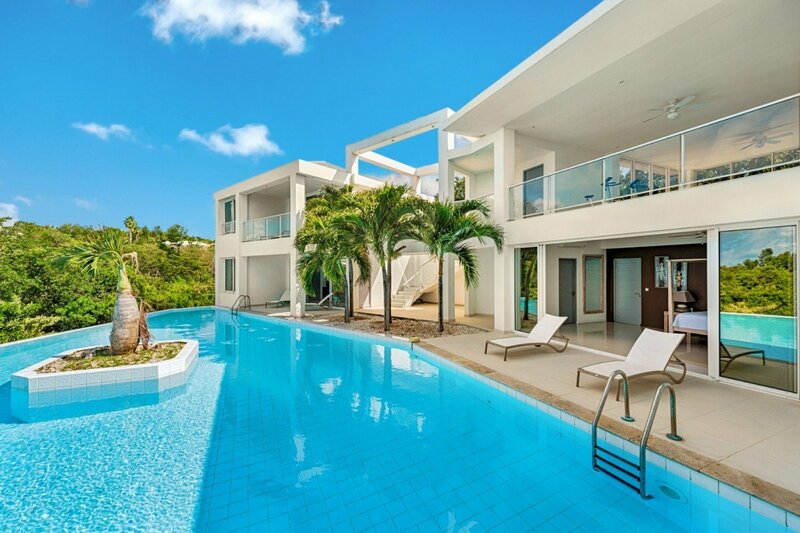 Villa Grand Bleu St Martin. 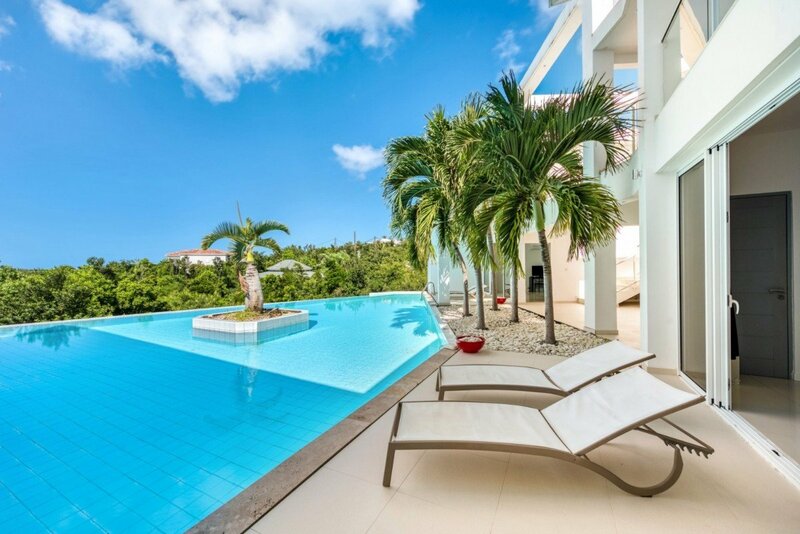 Villa Grand Bleu is a highly popular Caribbean villa embedded with a variety of amazing water features, incorporating and surrounding it with an idyllic rock stream that empties into a lovely whirlpool off the main terrace and continues journeying through another two pools, each getting larger and more supreme than the other. 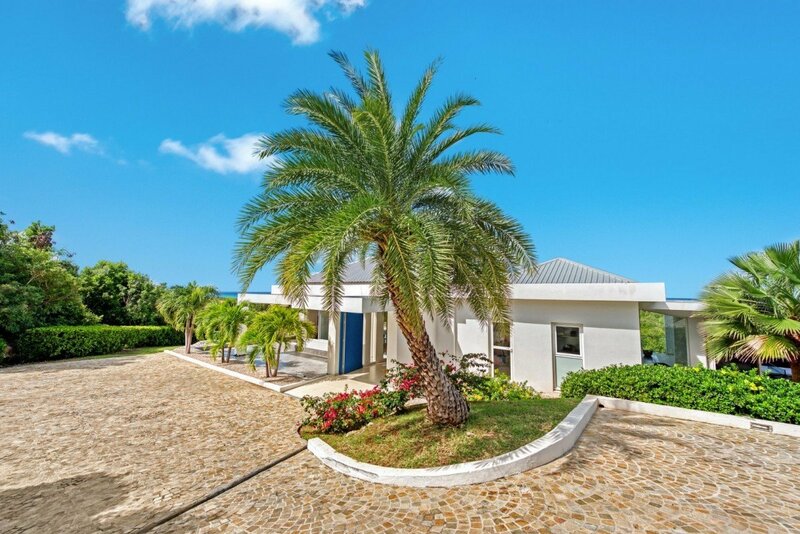 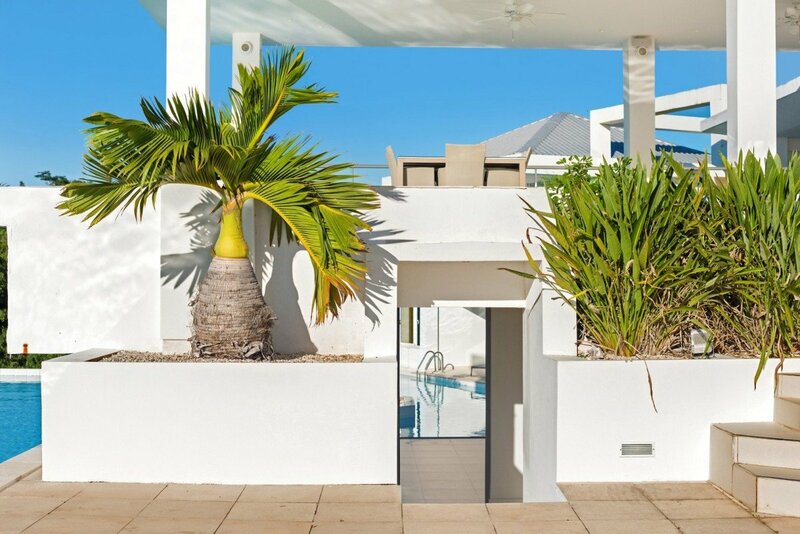 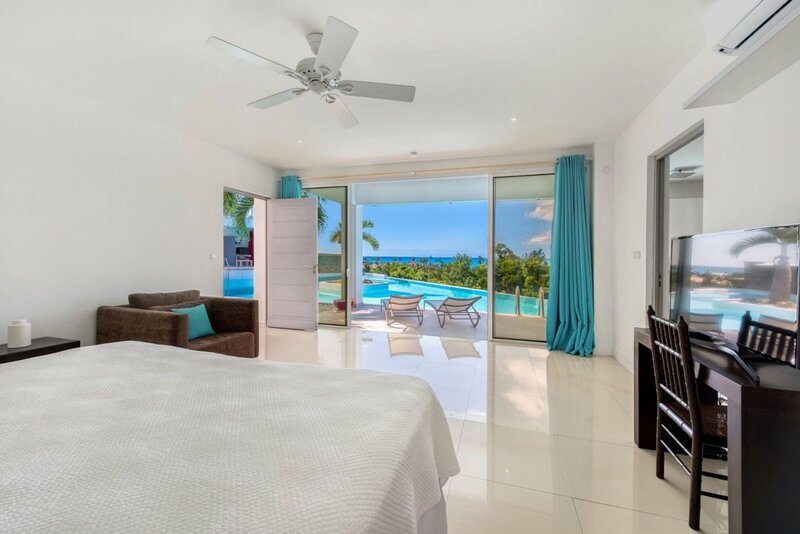 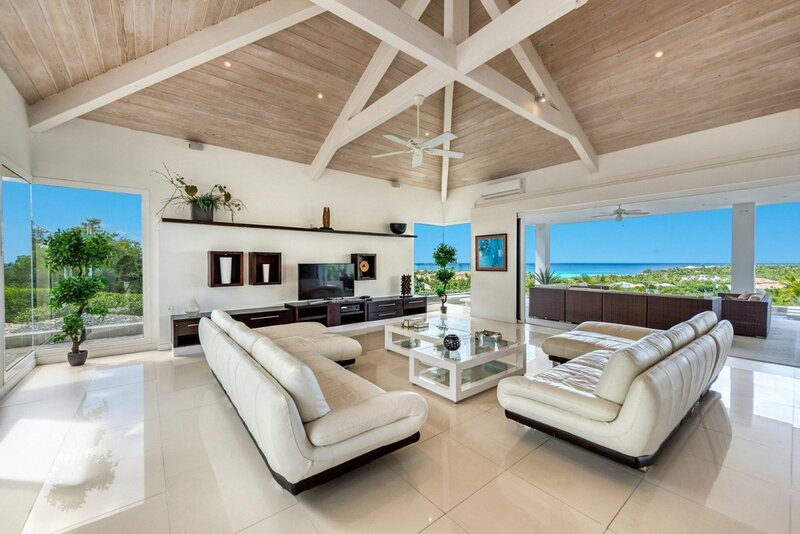 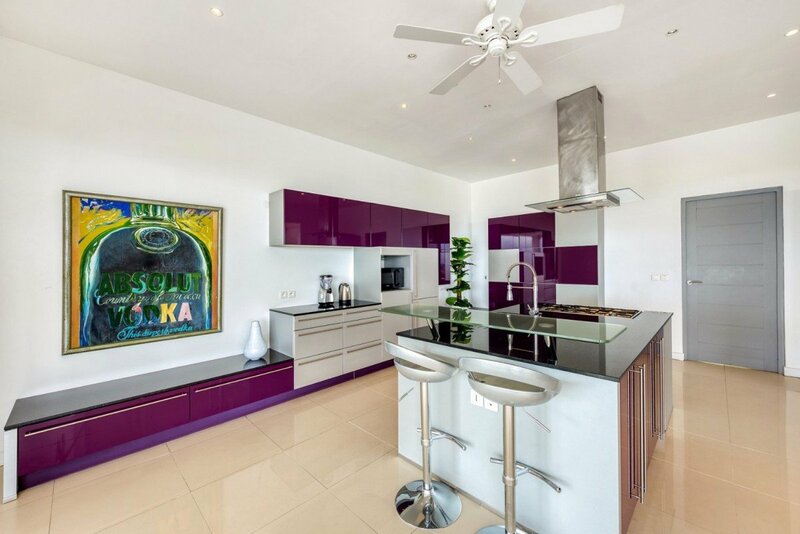 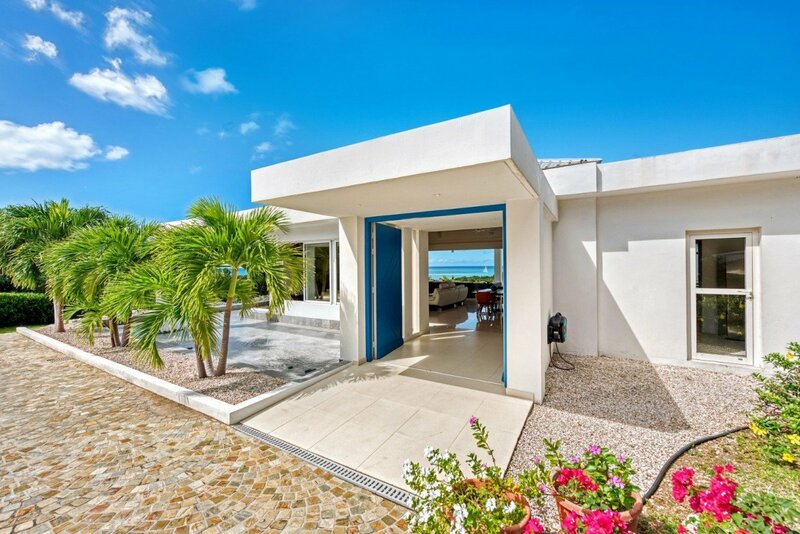 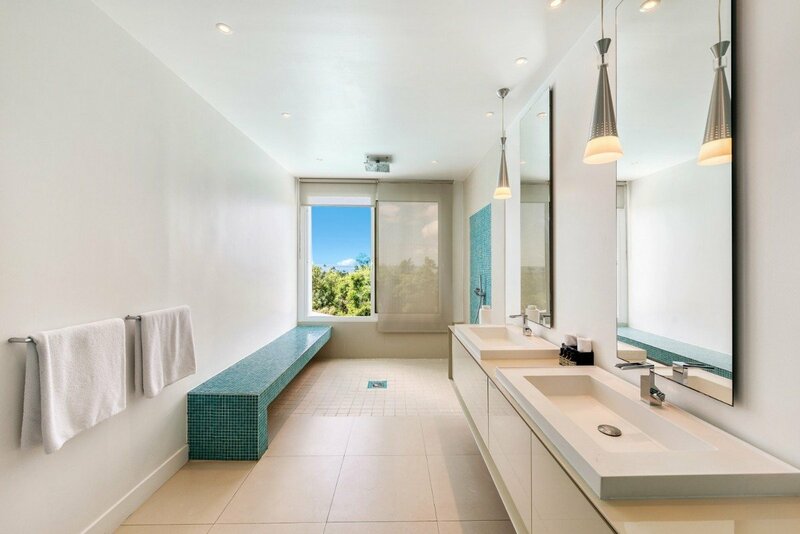 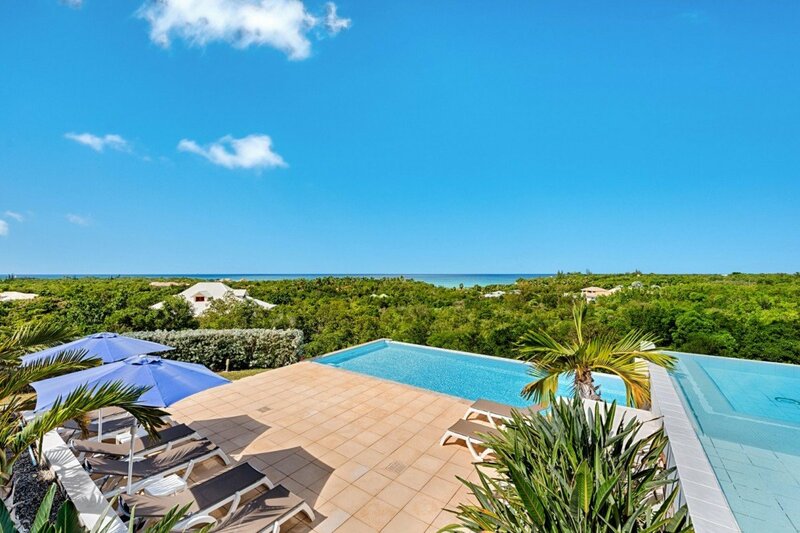 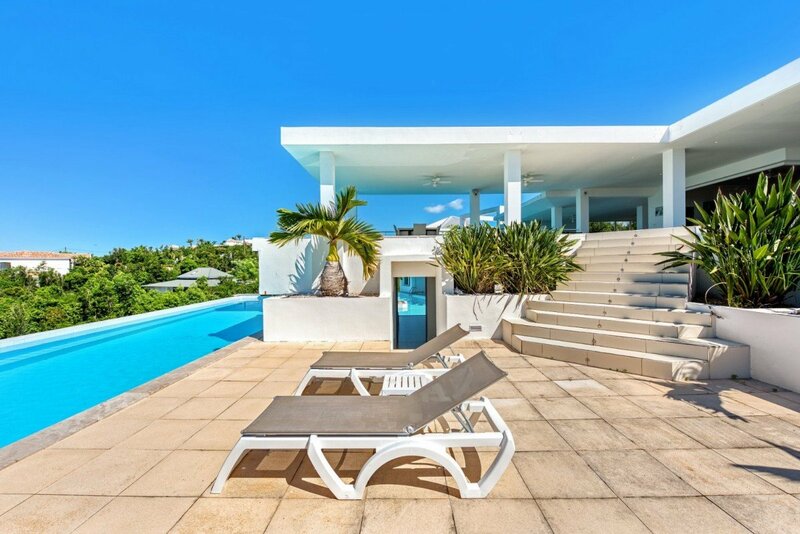 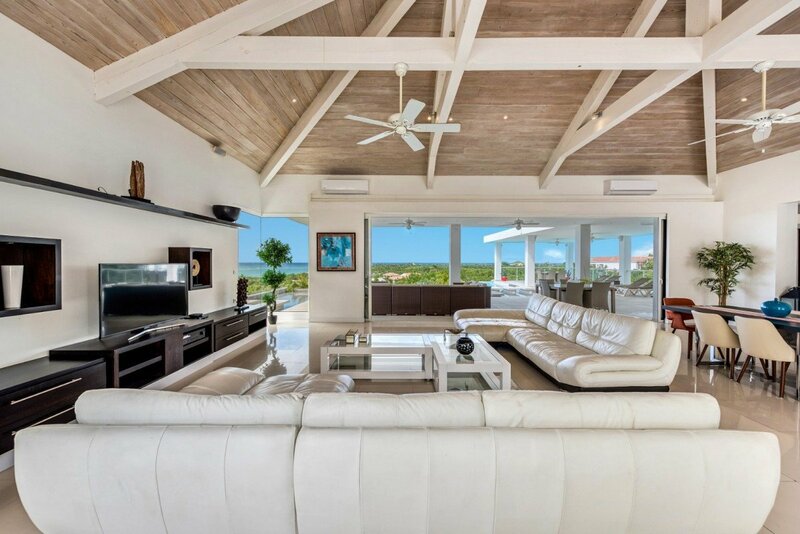 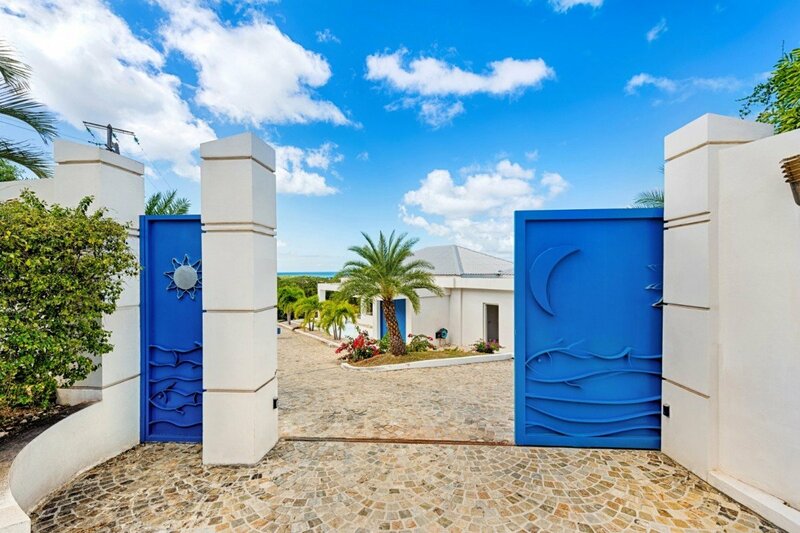 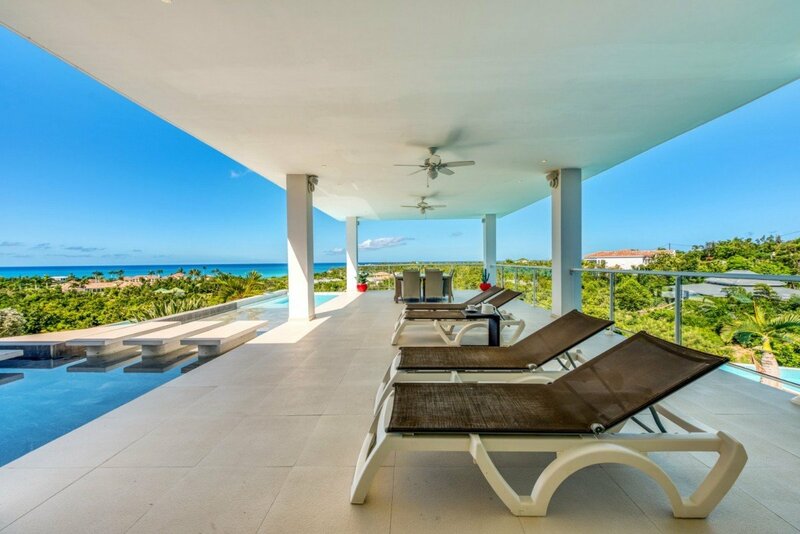 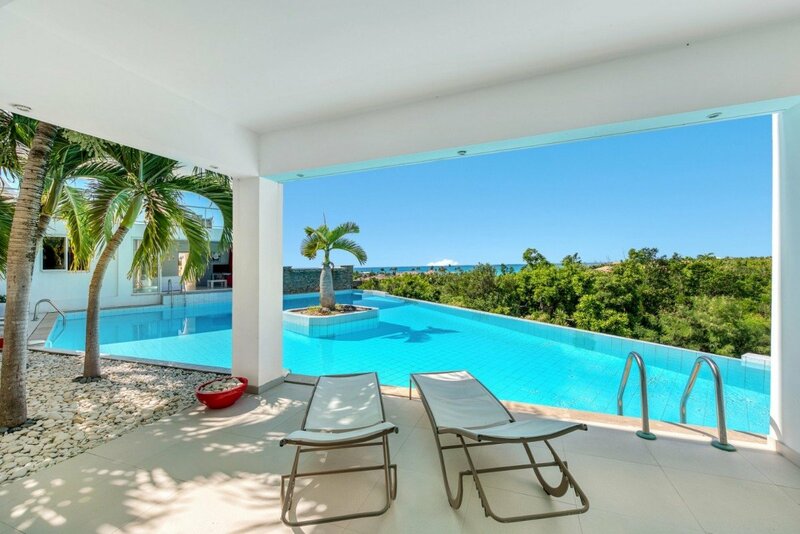 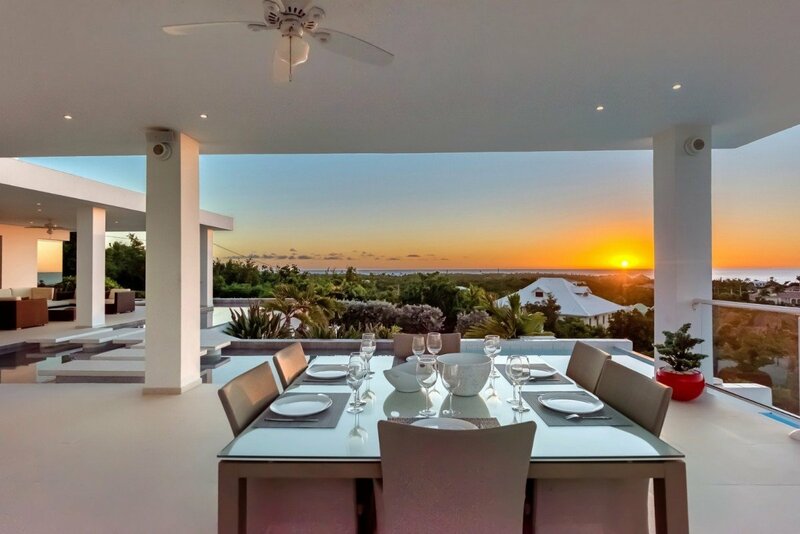 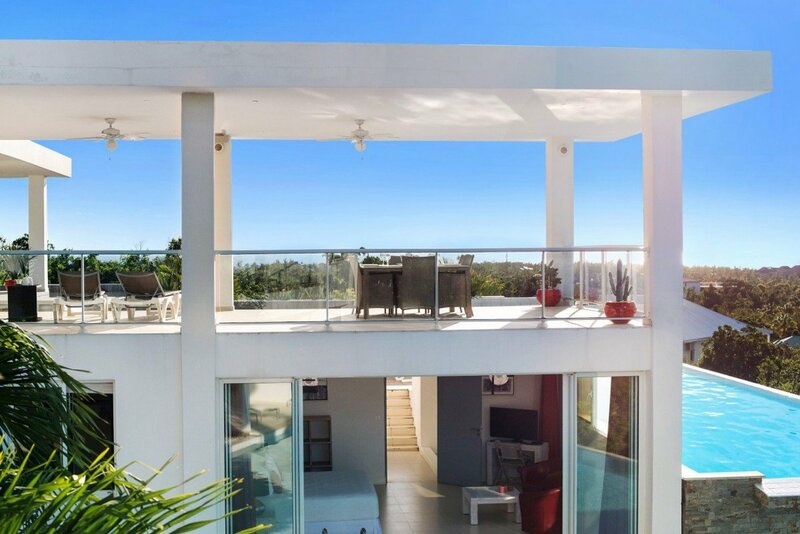 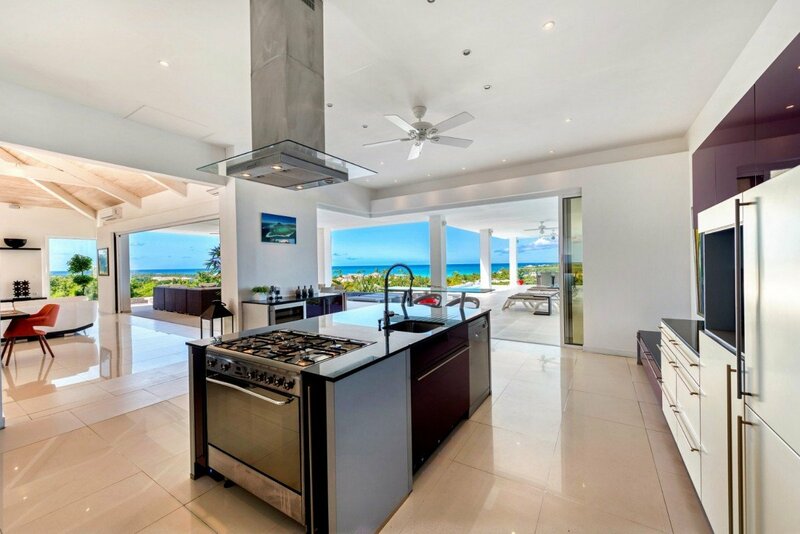 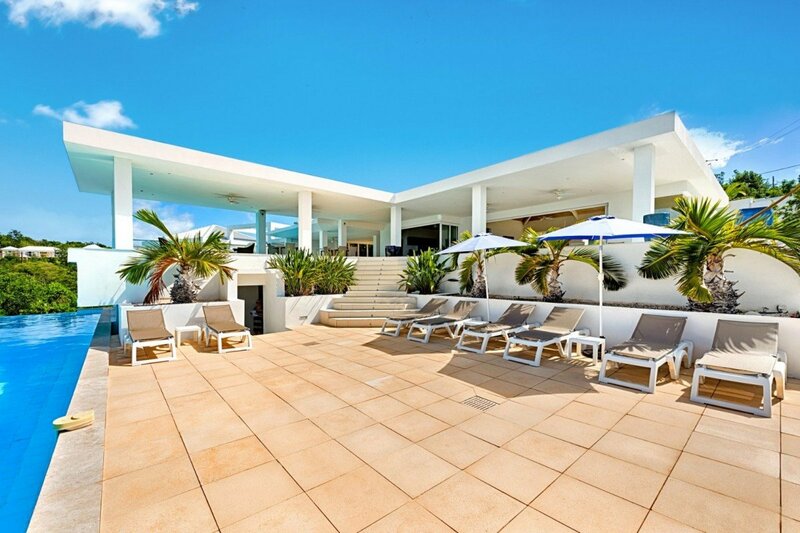 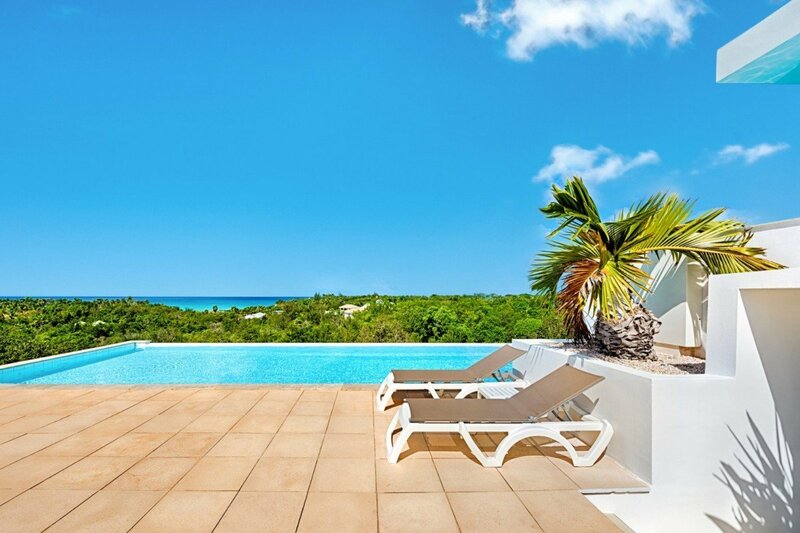 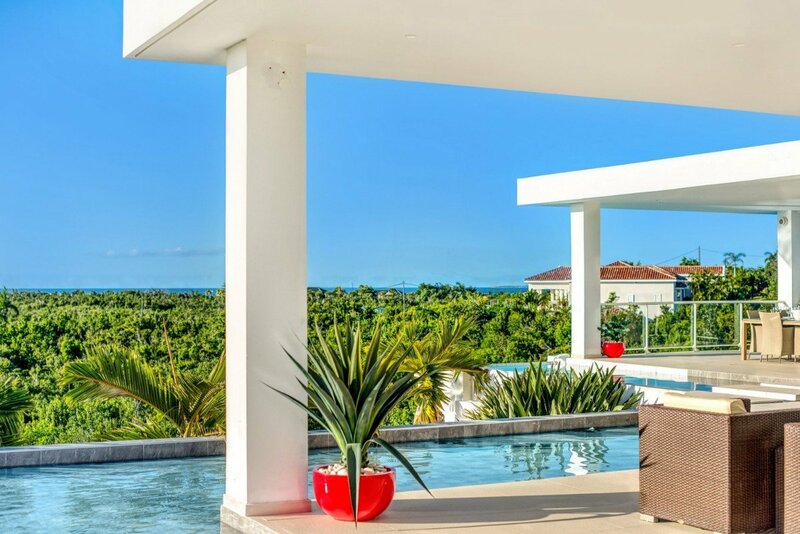 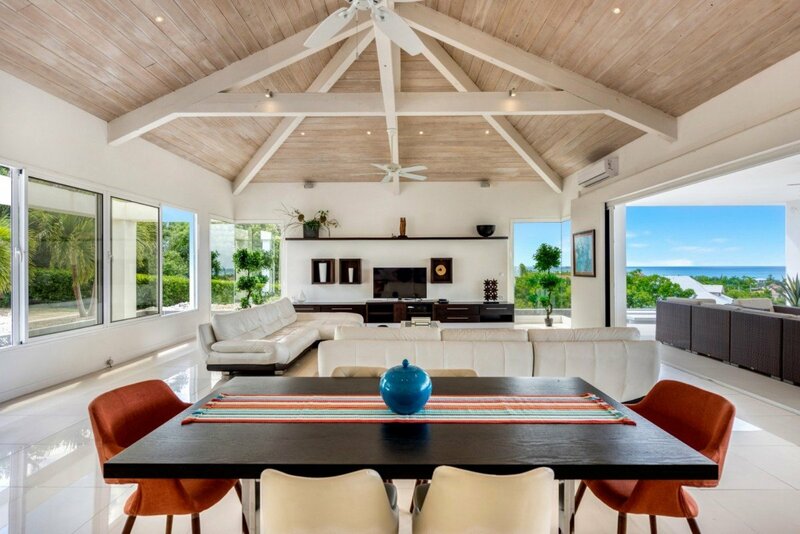 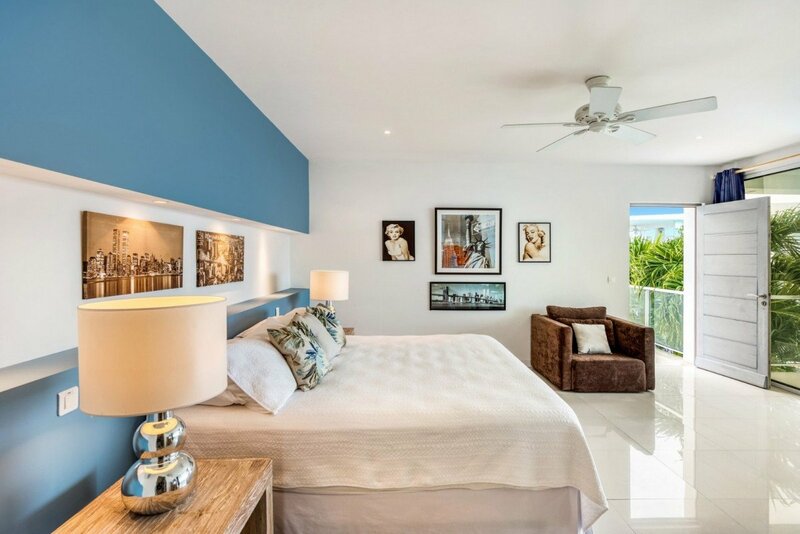 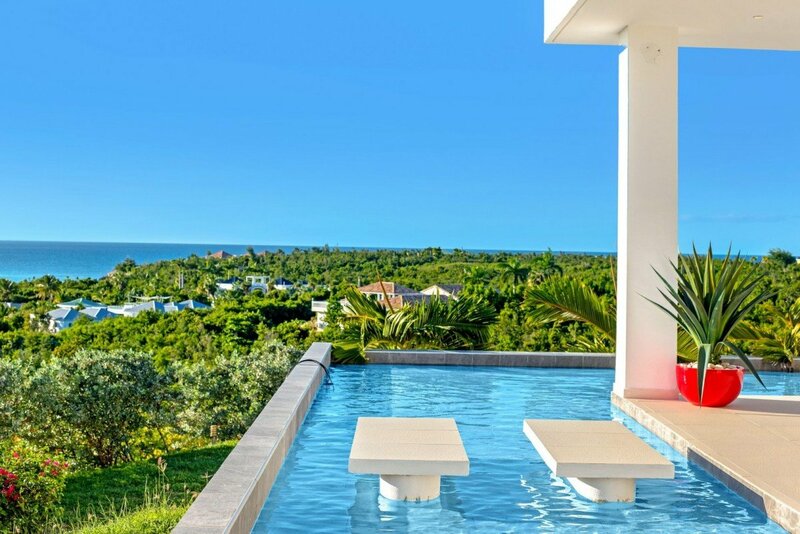 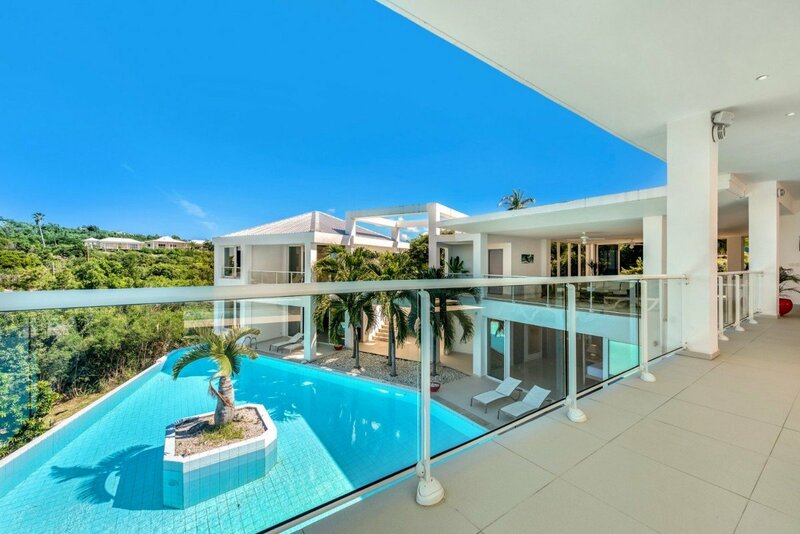 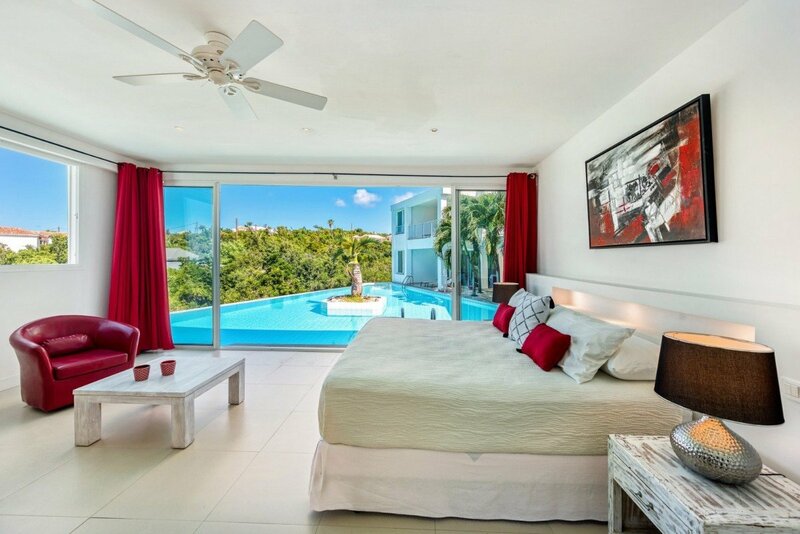 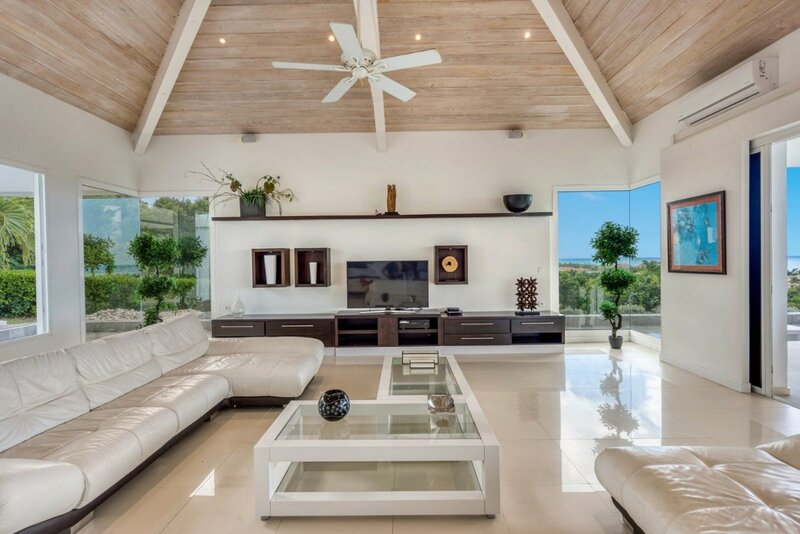 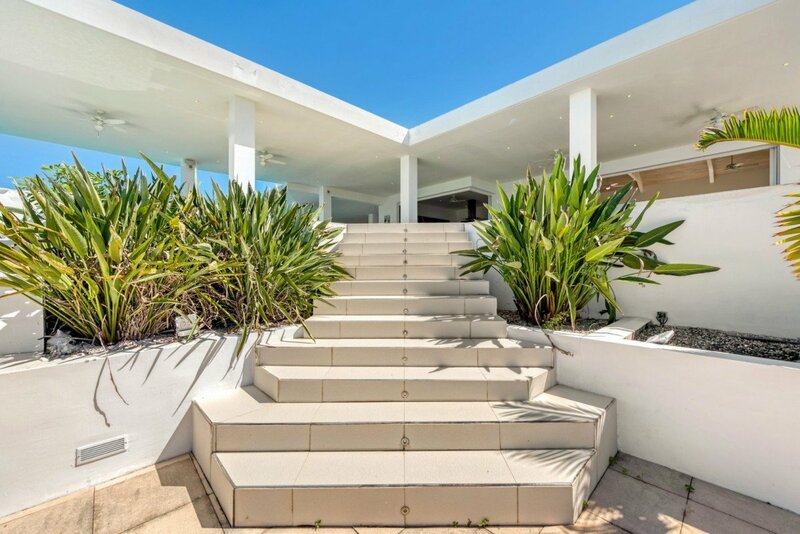 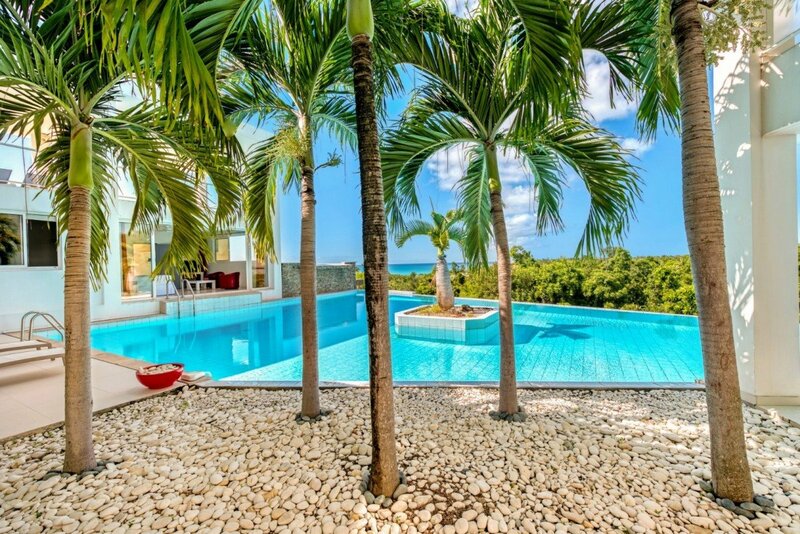 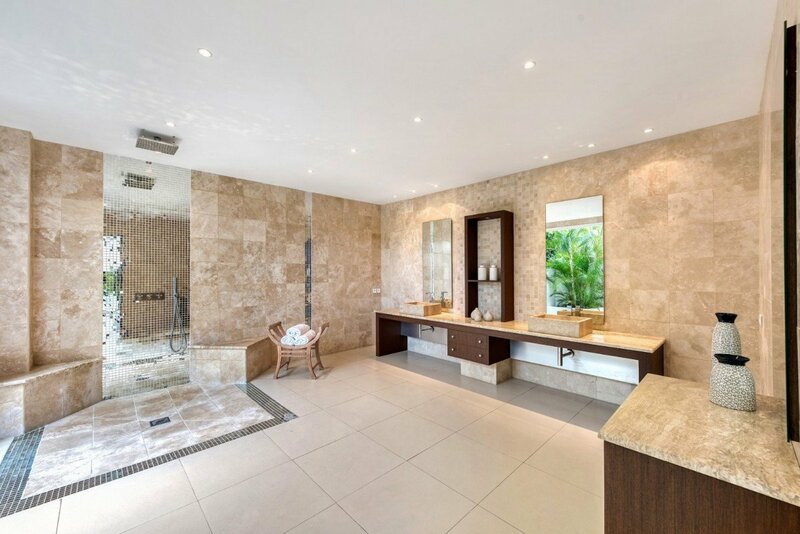 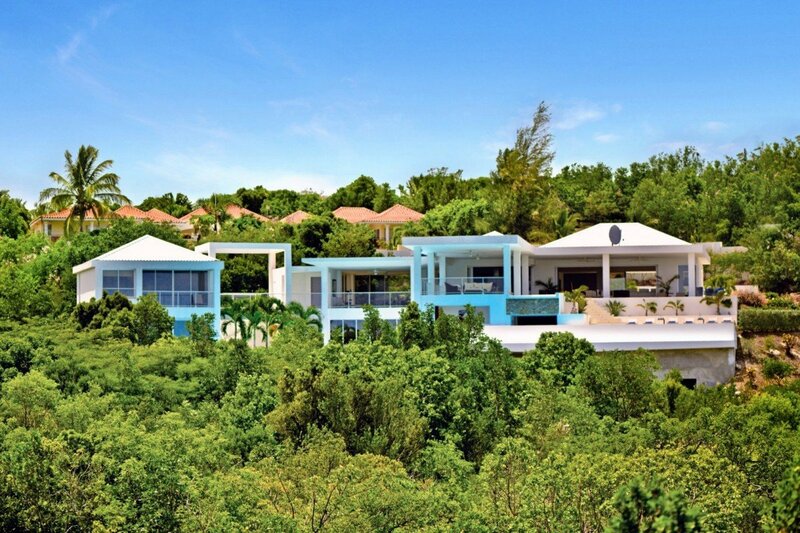 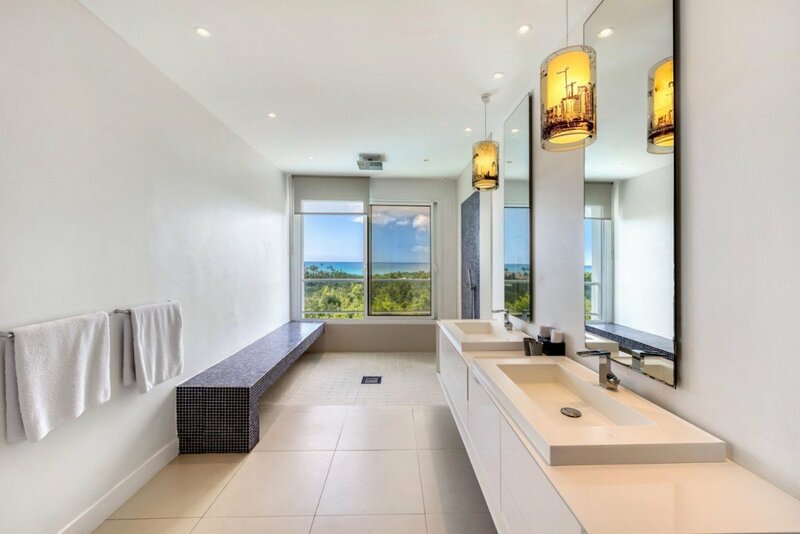 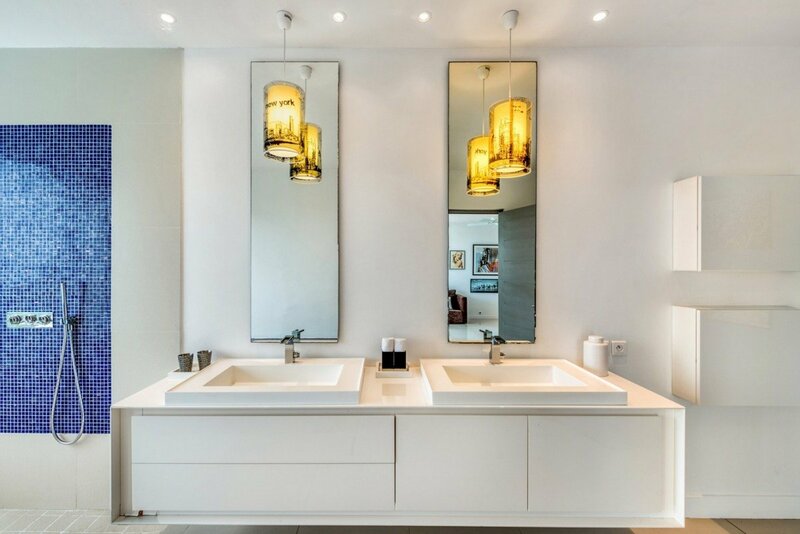 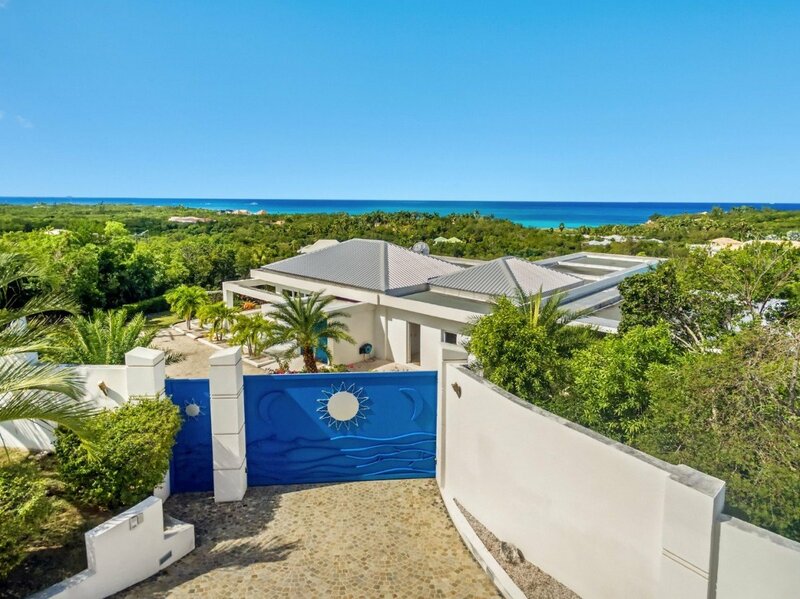 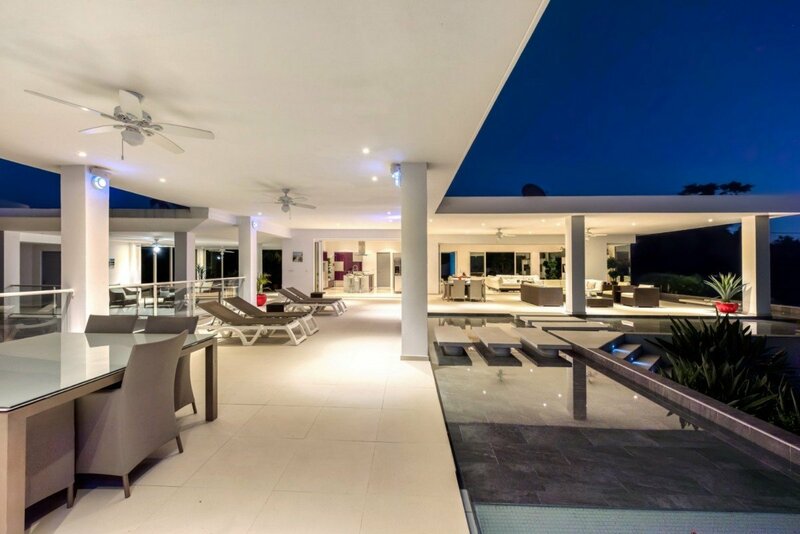 Located in the exclusive gated community of Terres Basses, the villa Grand Bleu is a beautiful St Martin villa rental with a contemporary edge. 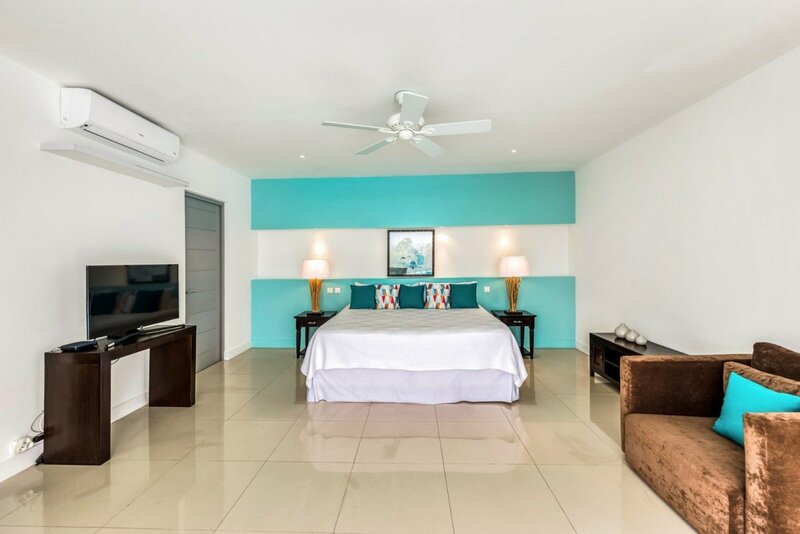 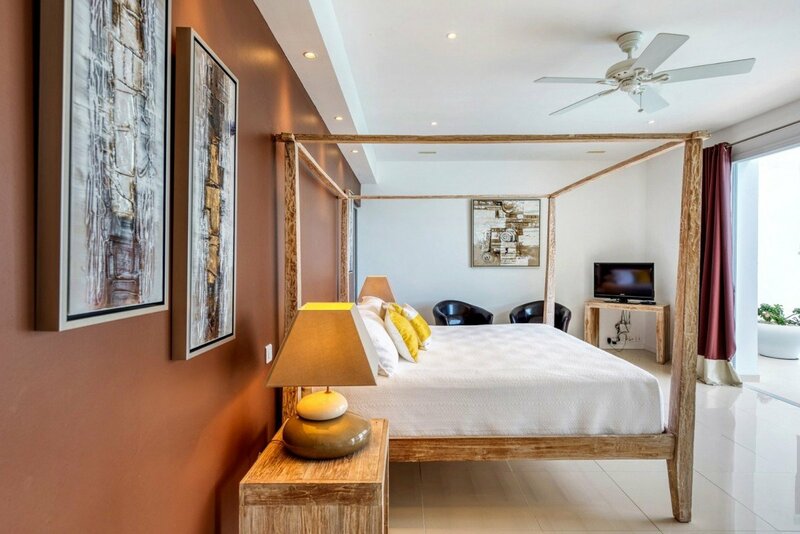 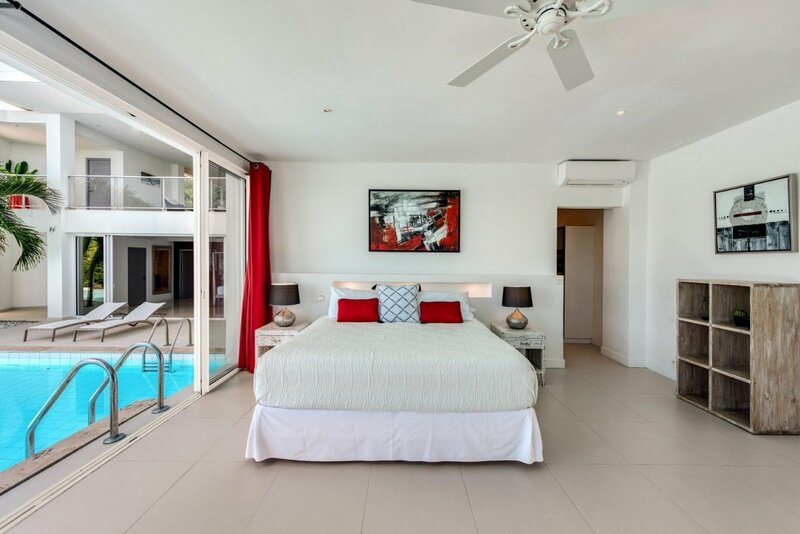 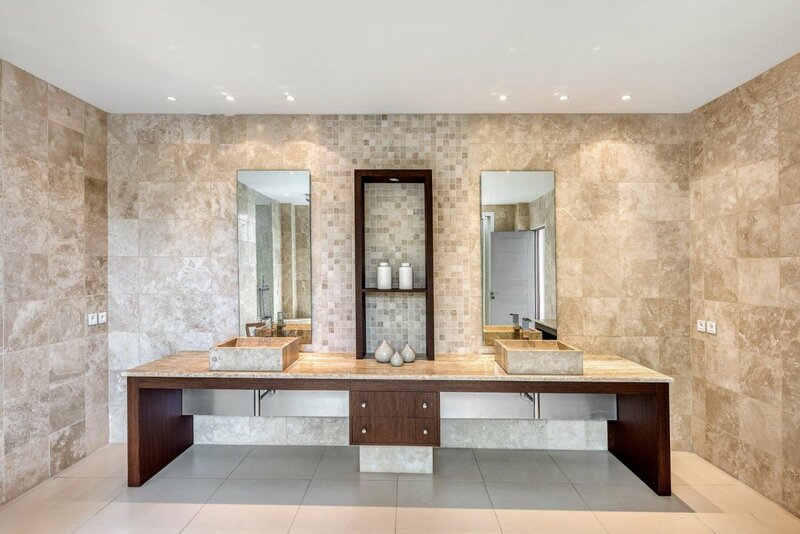 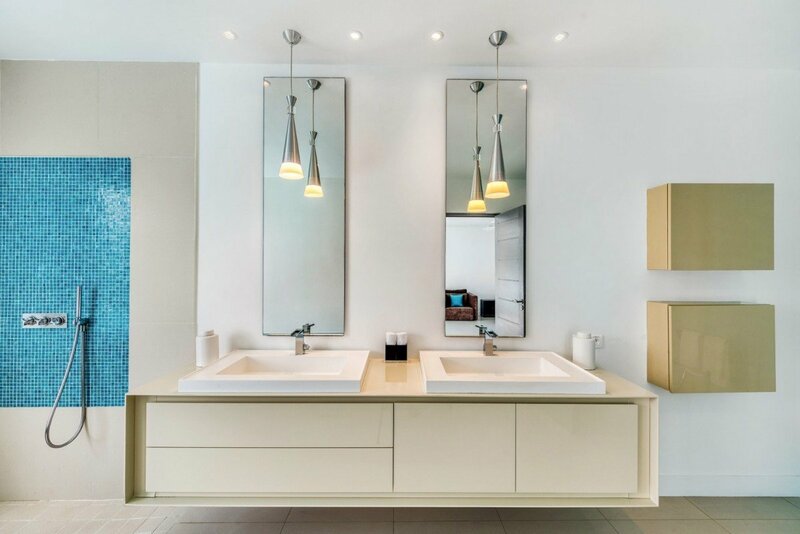 The four bedroom suites are expansive, artistic and nicely furnished with their very own fully equipped, private en-suite bathrooms and generous flat screen TV. 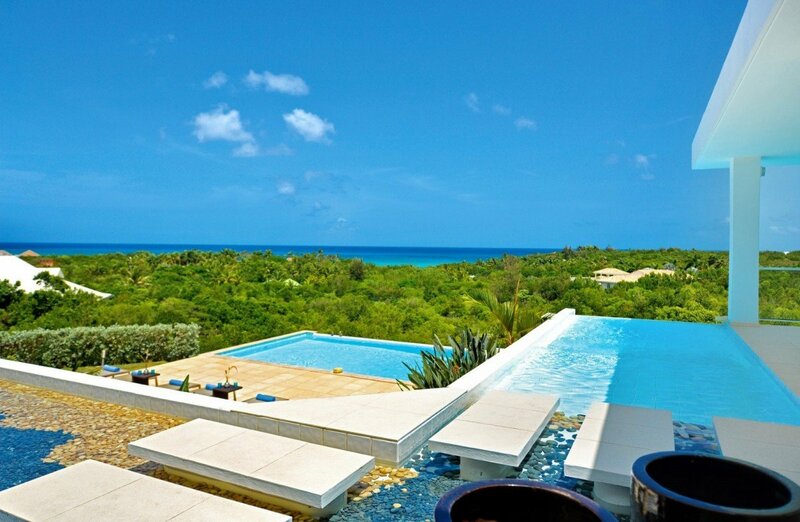 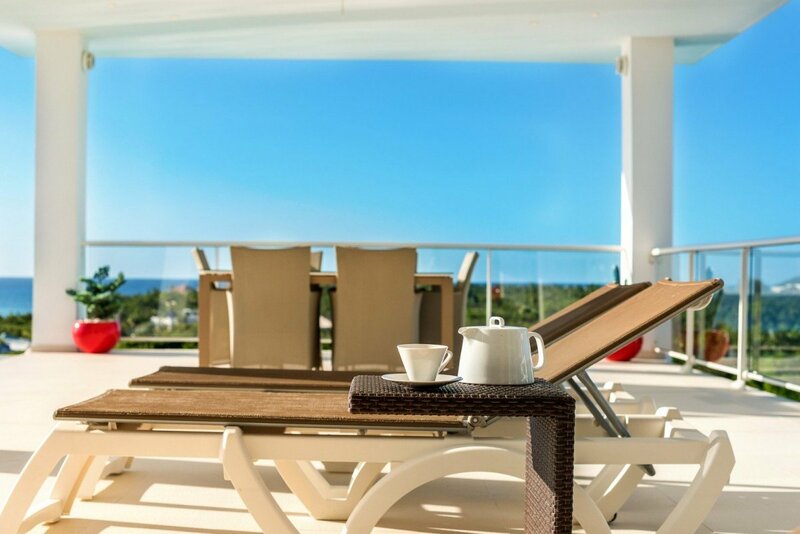 The terraces outside offer multiple lounge and dining areas to allow guests to make the maximum of their Caribbean experience; you may choose to enjoy a romantic evening with your sweetheart under the magical evening sun or watch you children splash around in the shimmering blue pools. 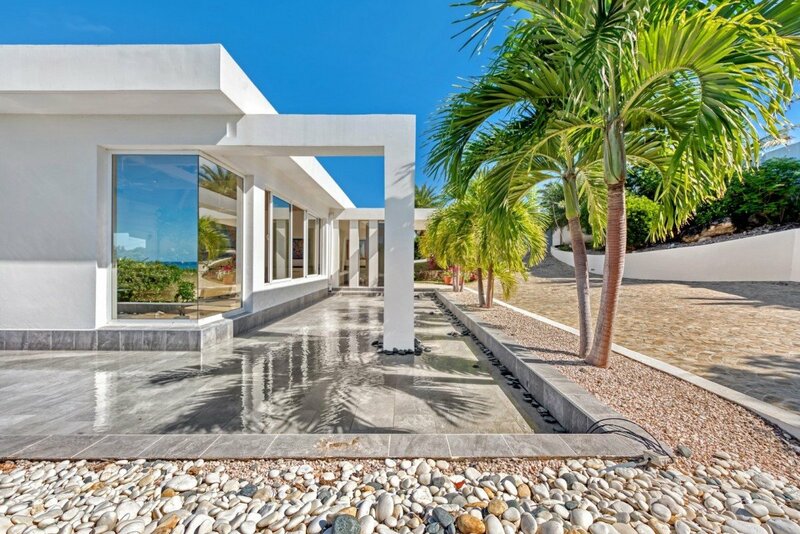 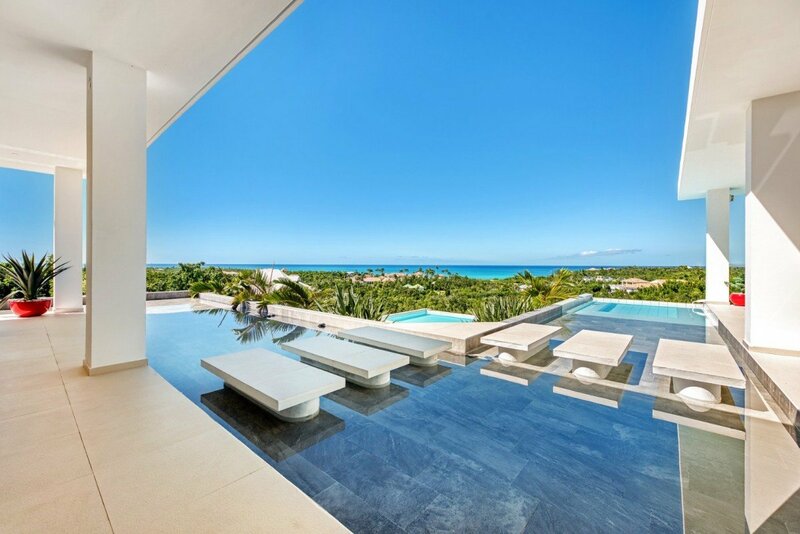 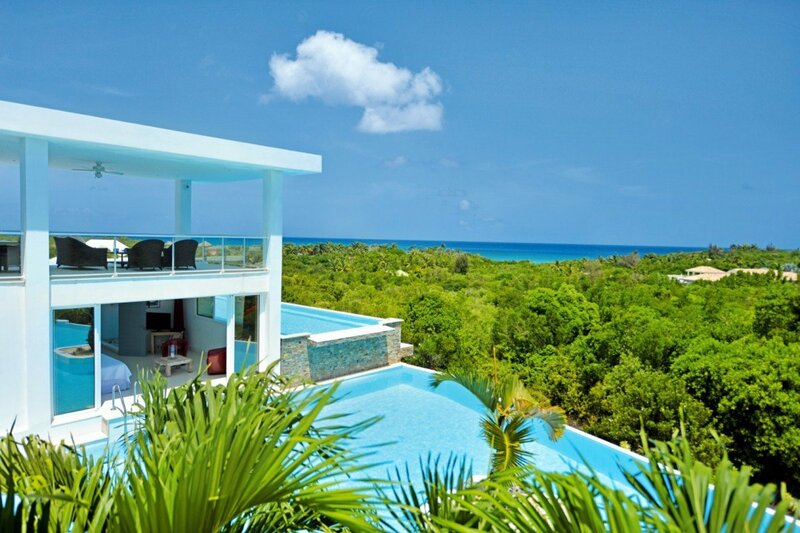 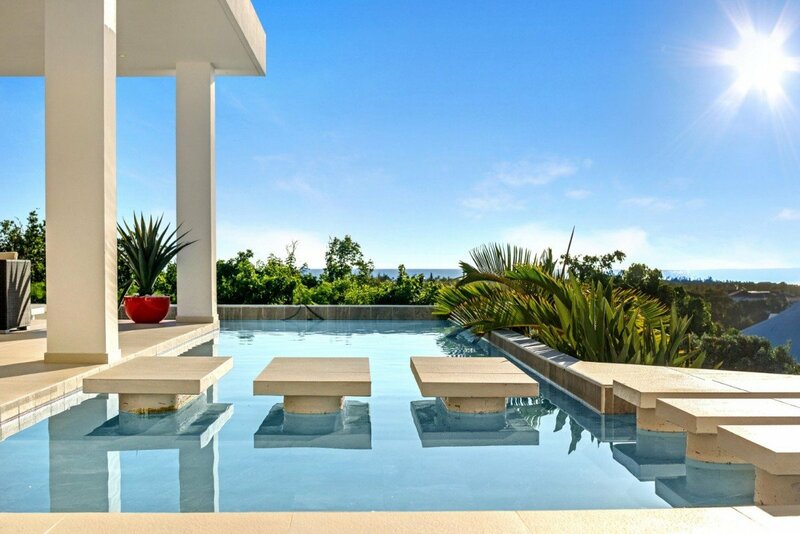 Though a minimalist in design, this St Martin villa will deliver far more than expected. 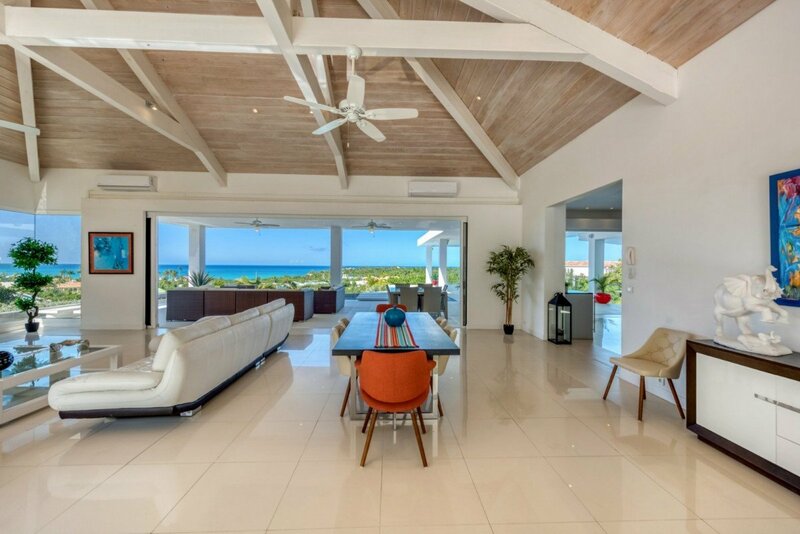 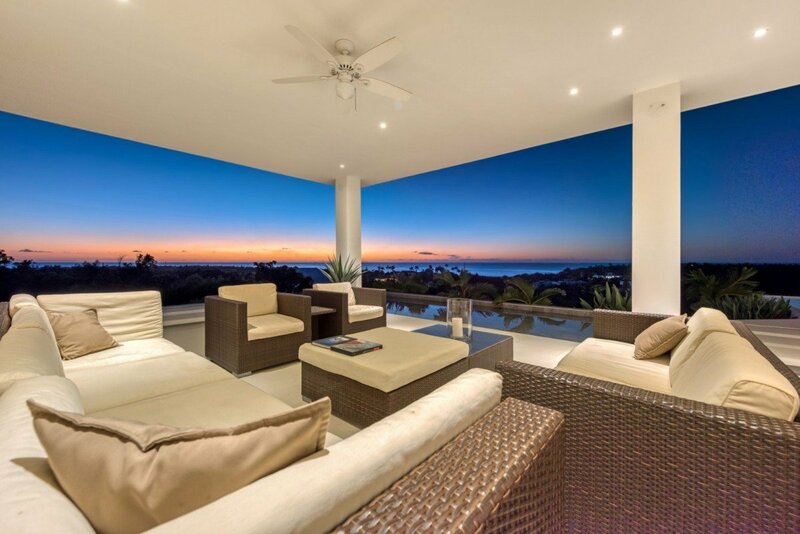 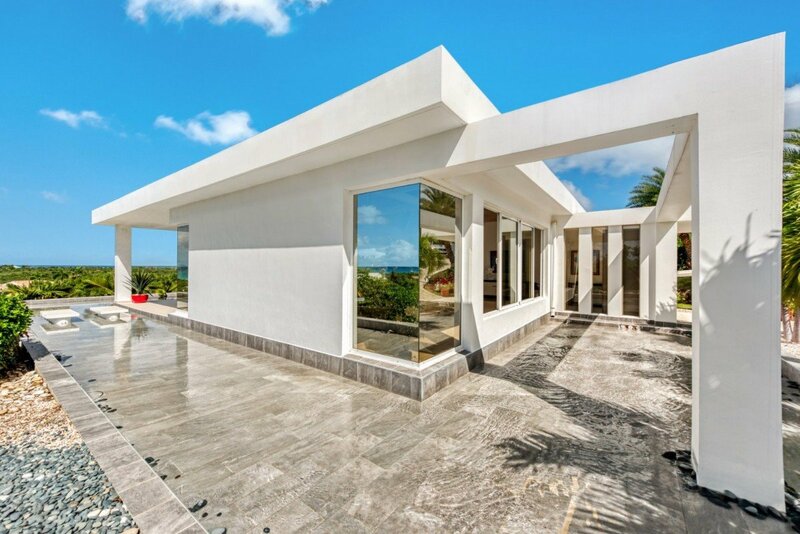 The guests will enter the villa through a spacious living room with collapsible glass walls, allowing for easy access to the delightful terraces outside and if you wish to stay indoors, you can open them to enjoy the soft Caribbean winds. 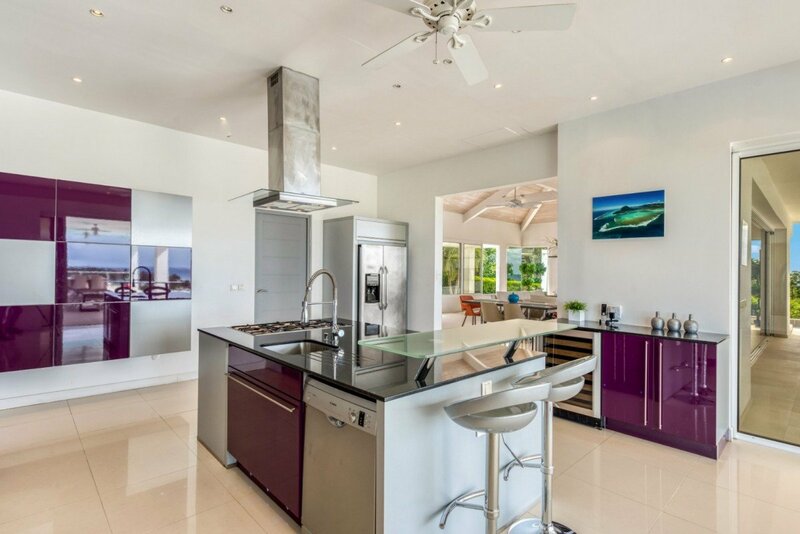 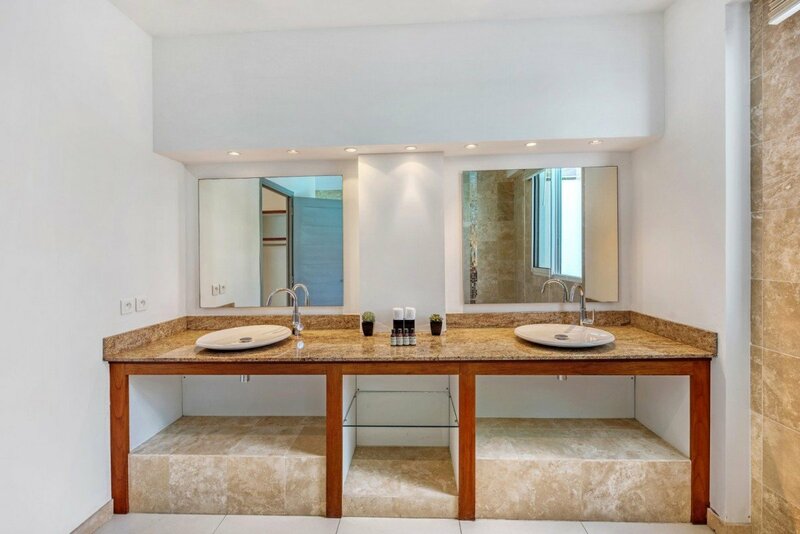 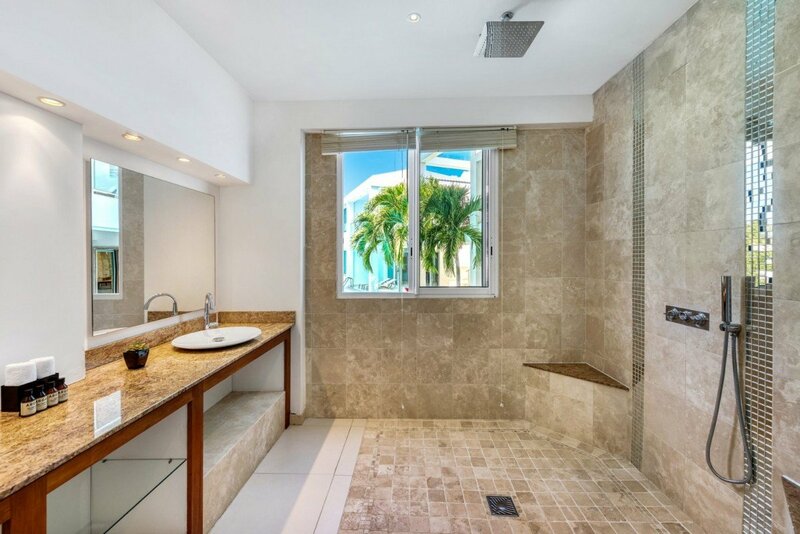 Just off to the side, there is the state of the art kitchen, fully furnished with all the necessary gear and for those who wish to remain active on their Caribbean vacation, there is some professional gym equipment and you can even have a game of table tennis on the main level! 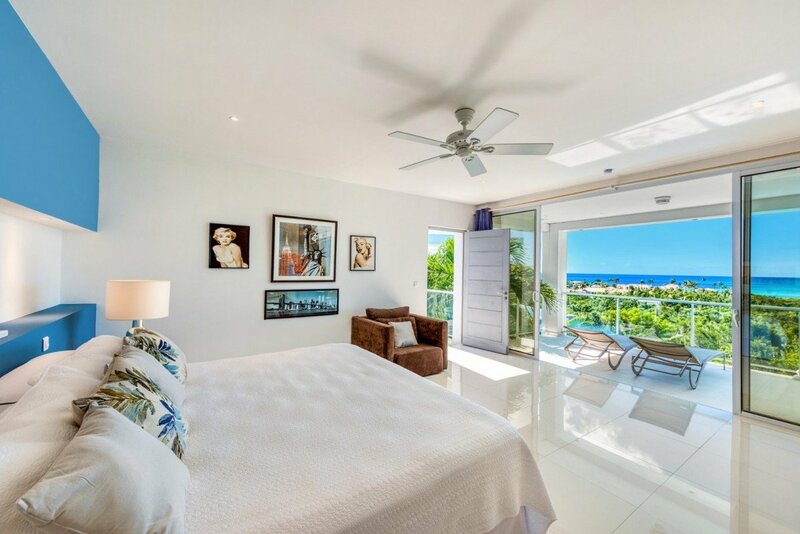 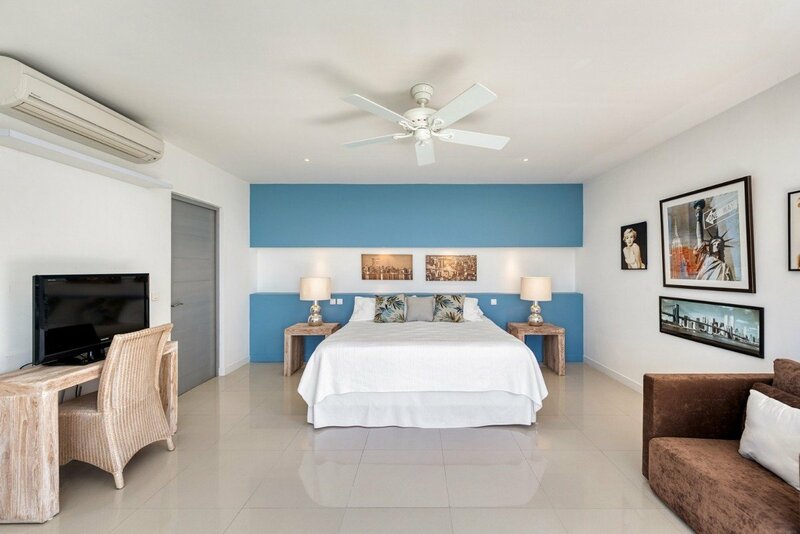 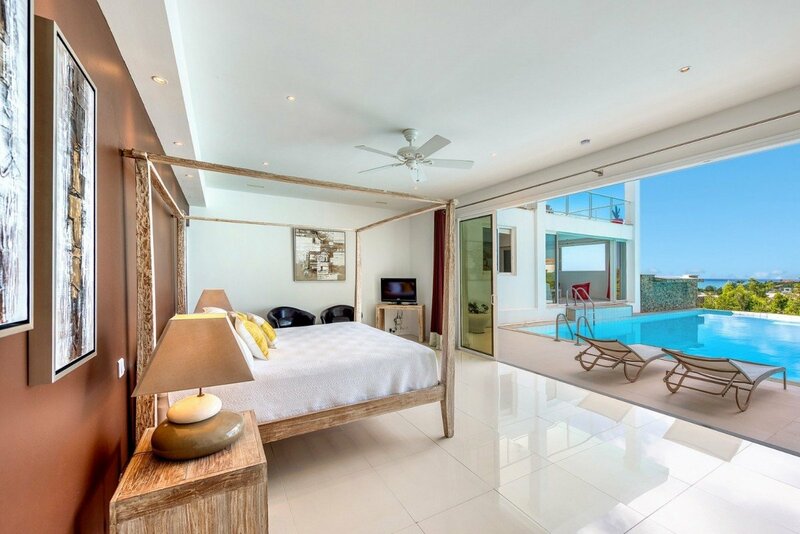 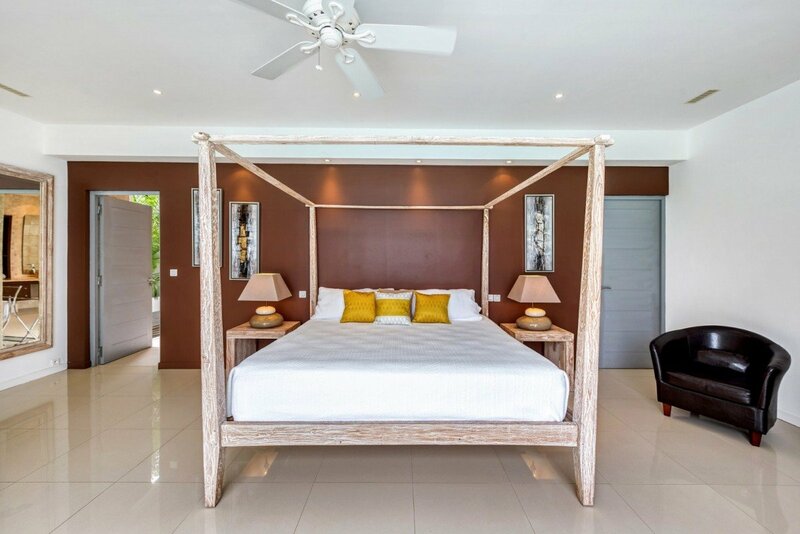 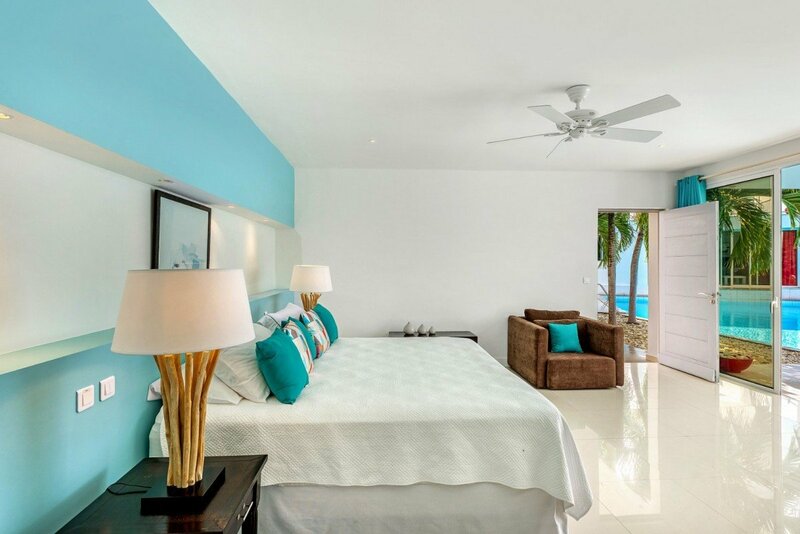 The lower three bedrooms have easy access to the pool directly in front of their sliding glass doors and the best part is that the villa is just minutes away from the breathtaking Plum Bay Beach.